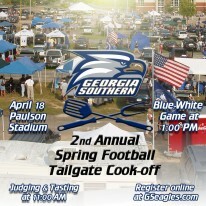 Georgia Southern Athletics is accepting individual or team applications for competitors in the second annual Spring Football Tailgate Cook-Off set for April 18 at Allen E. Paulson Stadium prior to the annual Blue-White spring football game. The winning tailgate and grill masters will claim the title of 2015 Spring Football Tailgate Cook-Off Champion, and will win a one-of-a-kind trophy, a one-night stay at a hotel plus two tickets to the Georgia Southern vs. Georgia game in Athens, Georgia, Nov. 21, 2015, and of course, bragging rights. “True Blue Barbecue,” Adam Pace and Jared Brown, won the inaugural Tailgate Cook-Off last year. To enter the contest, a team or individual must register online by April 14 and pay a $20 cash fee per entry on site April 18. All teams or individuals are responsible for providing their own food and equipment for grilling/cooking and will be allowed only one vehicle inside the cook-off zone. Participants are encouraged to grill, cook, steam, etc. their best food for fans to enjoy. Eagle fans are invited to serve as tasting judges for $3 to enter the tailgate zone, sample the food and complete a ballot to determine the top four. Scores from the tasting judges will be calculated and winners will be announced during the Blue-White spring football game. Tasting will begin at 11 a.m. and conclude at 12:30 p.m. The second-place winner will receive four tickets and two sideline passes to the home football game against Texas State Oct. 29, 2015, on ESPNU. Third place will claim two tickets and two meal vouchers to the home football game against South Alabama Nov. 28, 2015. 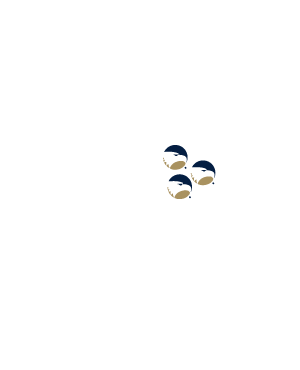 Fourth place will walk away with an autographed football and Georgia Southern prize pack. Registration is open now and Eagle Fans can submit their information here. For more information or questions, contact Athletic Marketing at 478-1500 from 9 a.m. to 5 p.m., or email Dan Adams at dadams@georgiasouthern.edu.